CSK vs MI Head-to-Head Record: Ahead of IPL 2019 Clash, Here Are Match Results of Last 5 Chennai Super Kings vs Mumbai Indians Encounters! IPL 2019 Today's Cricket Match Schedule, Start Time, Points Table, Live Streaming, Live Score of April 26 T20 Game and Highlights of Previous Match! Spider-Man Sparks New Friendship With Spider-Man: Far From Home's Supposed Villain Mysterio In This New Still! 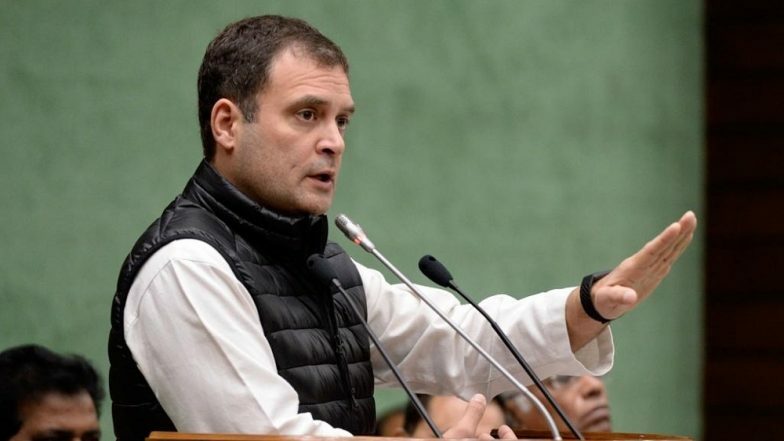 New Delhi, March 24: Congress President Rahul Gandhi on Sunday slammed Human Resource Development Minister Prakash Javadekar over a circular issued by his Ministry asking all departments to prepare "a shelf of projects" in line with "national priorities" for PhD scholars. New National Education Policy Draft to Wait Till Lok Sabha Elections 2019 Results, Says Prakash Javadekar. "Now, self-attested wise minister (Javadekar) of over intelligent Prime Minister (Narendra Modi) will tell the intellectuals of the country how should they do their work. It is perfectly said that a little knowledge is a dangerous thing," Gandhi wrote on his Facebook account. The Congress President posted a picture of Javadekar below his comment and also pasted a website link of an article published in a newspaper on Sunday carrying headline "HRD says PhDs only on 'national priority' topics, Kerala Prof quits". Prakash Javadekar Slams Congress for Questioning Claims of 250 Terrorists Killed in Balakot Air Strike. According to the article, Meena T. Pillai, a member of the Board of Studies of English and Comparative Literature at the Central University of Kerala, resigned in protest against the administration's order asking all departments to prepare "a shelf of projects" in line with "national priorities" for PhD scholars. The directive came on March 13, said the article, adding that the circular was issued at the behest of the HRD Ministry, which, at a meeting of vice-chancellors of central universities in December, had asked the VCs to "discourage research in irrelevant areas".